After 40 years buying music and video of this great band this was my first concert and first I was disappointed not to see and hear John and Rick I was glad to visit this concert. Great to see these guy's and maybe not everything was perfect I had a great evening. After having seen Yes in various line ups in Rotterdam, Utrecht, Amsterdam and Voghera (I)I was positively surprised to witness the mix of old and new in Heerhugowaard. Although one could hear, and see by the expression of their faces, some minor mistakes, I can only be happy with this performance. I don not think Oliver is less than his father, but we should not forget that the best keyboard player in Yes' history was Igor Koroshev as to dynamics and creativity. I really have to admit that I missed Jon as person but not as a singer. I think that Benoit David's voice is sparkling and brings you in another sphere. So it' s time for a new album! I have not encountered any of the problems (sound or otherwise) during this show, but then i wear ear protection to save my hearing from harm. This was i can hear every note played without damaging my ears. This is probably why some people thought the audio was too loud or the mix was not all it should be. I enjoyed the show tremendously! Benoit is no Jon, Olive is not Rick, Rick was not Tony etc, so why compare? They are different people, and they all do fine work. It does not mean to say that we do not want Jon back, i think even Benoit would agree that Jon should return. But if the time comes that Jon can`t perform these songs on stage anymore for whatever reason, Benoit has and could a great job of filling in for him. As Rick once said in an interview "There will always be a YES and they will always be great musicians!". Give them a chance, and YES will live on! During the afterparty everyone was so hyped about the show including the band, it felt like the golden olden days! I am of course a fan, starting to see YES in the eighties. I have seen them in different line-ups and this one works great. i saw a band, having fun together and they all played fantastic. I did not want to compare the new singer with Jon Anderson, that is unfair and not realistic. But the new singer performed very good and mister Wakeman junior too, in spite of all former reactions of attendees about his 'lack of emotion'. Just let this man concentrate on his job. He sure knows how to handle the keys. It was the sixth time I saw the band in the past 35 years. Without Jon Anderson what can I expect ? but I must say Benoit David did a great job. The Waerdse Tempel is a great concert hall and the sound and sonics were great and certainly not to loud. The concert started, as always, with The Firebird Suite followed by Siberian Khatru. Steve Howe shows us something, we already knew, he is a great guitarist but this night he talks with the audience something he never did before. One of the greatest moments of these evening was Tempus Fugit, from the Drama album, with a superb Chris Squire on the bassguitar. More great moments follows. Another Drama song, Machine Messiah, and Heart Of The Sunrise with a great performance of Oliver Wakeman. After 2 hours en the encore Starship Trooper the show ends. A great evening of a great band. 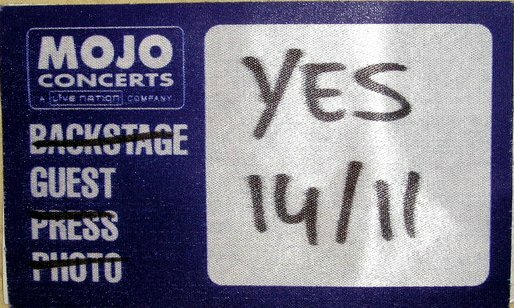 Over the past 25 years I have visited several concerts by Yes. I am a fan! But everytime I came home very disappointed. For everytime I had seen only individuals. The Reunion concert was different. That was the first time I saw a band on stage. Even if it was two bands merged into one. Tonight again I saw a band, a team. And they were enjoying themselves. And yes, I noted that Steve Howe missed notes, and I noted that Chris Squire fucked up sometimes. But I also noted that he made fun about his mistakes with Oliver Wakeman. And much as I like to hear the songs in the way they have been recorded once, I love to see the bandmembers having fun on stage. So for me this was the best concert ever. Even without Jon. I do admit, I was a bit afraid...a new singer. But Benoit David was great. His voice can be compared to Jon's. I would really like to thank Benoit, Steve, Alan, Chris and Oliver for a grand night in Heerhugowaard and I hope that Alan's injury (his left hand was bleeding at the end of the show) isn't as bad as it looked.